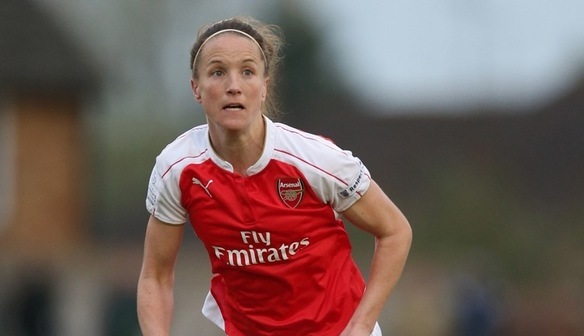 Casey Stoney has stressed the importance of Arsenal’s players not panicking after they returned to winning ways with a 2-1 victory away to Reading. Jordan Nobbs and Dominique Janssen’s goals on the half-hour and hour mark helped the Gunners bounceback after consecutive defeats to Manchester City and Chelsea in FA Women’s Super League 1. But Arsenal had to survive a late scare when Emma Follis curled past Sari van Veenendaal with less than a quarter of an hour remaining and then Lauren Bruton headed agonisingly wide in the final minute of normal time. Stoney said: “If we had gone away with a draw we would’ve had to seriously look at ourselves. We just need to stay calm in those moments and play the football that we know we can play because we can play some fantastic football. We need to pass the game out rather than panic. “I think it should have been more comfortable given the first half but also in the second half we had a couple of one-on-ones with the goalkeeper and we haven’t taken them. “But credit to Reading, they never give up, they always fight, they always test you and obviously they’ve got a goal. Nobbs gave Arsenal the lead when she fired towards the top corner from 22 yards and Grace Moloney could only help it on its way. Reading were fortunate to go into half time only one behind when Vicky Losada saw her effort saved, before Natalia was adjudged offside when she tucked the ball into the net. And Arsenal picked up the second half where they left off with Moloney forced to stop both Dan Carter and Janssen, before the latter doubled the tally as she headed into the bottom corner on the hour. After Reading’s late fightback, Arsenal’s Asisat Oshoala failed to make the scoreline more convincing when she rounded Moloney only to fire over the bar. Reading’s Bruton said: “In the last 20 minutes we actually did really well and it’s a shame that we didn’t start that way. “It was a tough game and it’s just a shame that we had all the pressure in the last 20 minutes, nicked a goal and we probably could’ve nicked a couple more but at the end of the day it wasn’t meant to be. Reading FC Women (4-5-1): Grace Moloney; Rebecca Jane, Kirsty McGee, Molly Bartrip, Shelly Cox; Emma Follis, Rachel Rowe, Kayleigh Hines, Lauren Bruton, Helen Ward; Nia Jones. Substitutes: Melissa Fletcher for Jones 45, Amber Stobbs for Ward 71, Laura-May Walkley for Hines 71. Arsenal Ladies (4-3-3): Sari van Veenendaal; Alex Scott, Josephine Henning, Casey Stoney, Leah Williamson; Dominique Janssen, Jordan Nobbs, Vicky Losada; Danielle Carter, Katie McCabe, Natalia. Substitutes: Fara Williams on for Nobbs 63, Marta Corredera for Scott 77, Asisat Oshoala for Natalia 81. Substitutes not used: Emma Byrne, Jemma Rose, Emma Mitchell, Danielle van de Donk.